When I was looking for a book title and a name for my rejuvenated blog I wanted something slightly “off the wall”. Whilst I was writing the chapter about surgery looming I came across the consultant’s explanation of the CT scan he had in front of him. “It looks like you’ve got an octopus in there.” That set my imagination running and I pictured the scene in theatre where the surgical team had “released the octopus”, cut out the offending bit and then wrestled the remainder back, safely, into my abdomen. Search for title over and seed of idea for book cover sewn. As I neared the end of writing it occurred to me that there was a second octopus to be wrestled. 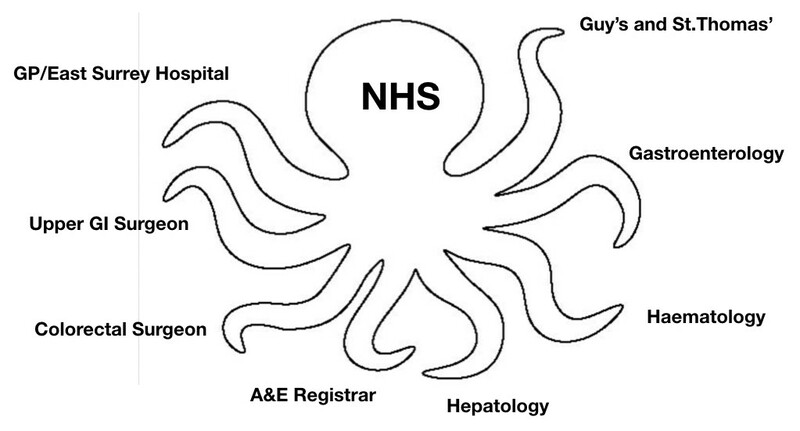 It’s potentially a problem for all of us that suffer from chronic illnesses, namely, managing our route through the multiple tentacles of the NHS system with multiple consultants, procedures, specialities and clinics. Add to this the lack of a universal patient record system that can be accessed in different hospitals and it is apparent it’s not neccesarily a simple process. Life was simple when being treated by one gastro team at one hospital. It wasn’t until 2010 that another hospital entered the equation as my local hospital were unable to cope with the complexity of the forthcoming surgery and referred me to St.Thomas’. Some “tentacles” act in a co-ordinated manner; others seem to be a law unto themselves. Some tentacles communicate well with the others, unaided; others need a helping hand. For example, if you’re booked to go for a procedure, let’s say an MRI scan, then it makes sense that your next gastro appointment is after the radiologist has written the follow-up report. Similarly, if you’ve had biopsies taken during a colonoscopy, you want the results to be available before you meet your gastro. This is not rocket science but if not co-ordinated then you simply end up wasting valuable appointments, consultant’s time and, just as importantly, your own time. In the past I’ve let the system take its course but with mixed results so now I like to give it a helping hand. This is getting more difficult with the apparent demise of the dedicated medical secretary. For several years, when the frequency outpatients appointments and procedures had reached its height, I had the pleasure of dealing with a truly exceptional one. Let’s call her Sally. Any issues would be quickly resolved by a simple exchange of emails. Sadly she left the NHS. Nowadays I contact my consultant directly, but sparingly. I don’t particularly like doing it as I know he is already exceptionally busy. I can justify this approach to myself as in the long run time/resources will be saved by avoiding abortive appointments. I suppose you could now say that I am “massaging the octopus” rather than an all-out Greco-Roman grapple. It struck a chord as, over a period of 40 years, I have met a large number of doctors, consultants and even a few surgeons. Some have been good; some bad; some exceptional; some would be better off in research roles. I would put my current gastro in the exceptional category, especially if he is reading this just before performing a colonoscopy on me. But, in all honesty, there is nobody else I would rather have sticking a camera where the sun don’t shine. He can handle bends better than Lewis Hamilton. One of the qualities that Sharon highlighted was the sense of safety that a good doctor gives the patient. It’s not something I had really thought about, not consciously at least, but I now realise that the feeling does underpin the best consultations and helps encourage open discussion. In a safe environment you tend to open up. The ability to read body language and “language” language, if that makes sense. That’s picking up the messages in a patient’s demeanour and the words they use and then adapt how the consultation is structured. Carefully choosing the words or medical terms that get used and ensuring the patient understands them. Definitely not sticking to a “one style fits all” approach or spending the whole appointment staring at notes on a computer screen. (That got me wondering what training is given in “people skills”? I accept there will be the “naturals” who already have an inherent ability to adapt their consultation style but what of the others who have that innate skill in varying degrees. Are particular medical students steered towards research rather than patient facing roles? Half way through her post Sharon voices her fear that the exceptional doctors will become burnt out, victims of their own success. It’s a subject I have discussed with my own consultant as temporary referrals from other hospitals inevitably choose to become permanent patients and his department’s workload is ever increasing with static resource levels. Shortly after reading her post I happened to hear an interview on the radio (BBC Radio 5 – Pienaar’s Politics) with an eminent surgeon who had become so stressed and disillusioned by the pressures within the NHS that he has left the profession and now bakes waffles in SW19. As he said “you only get one shot at this life”. If we turn the question on its head – “What are the qualities that make for a good patient or an exceptional one?” There are the obvious – “takes their medication”, “turns up to appointments” but are there other behaviours we can adopt that will ease the pressure on doctors’ time and resources? Maybe this would be a good subject for a future #Tweetchat. A subject I’ve written about before but always worth revisiting. These are my experiences within three UK NHS Hospital Trusts and span 40 years. In an ideal world each of us would have our full medical record available in a universally readable format that could be easily accessed by any medical professional that is treating us. Now let’s look at the real world. If you are a relatively new patient who hasn’t moved hospital and not had an in-patient stay then you may indeed have a complete record, held electronically, on an IT system. If, however, you are a long term patient who has moved between GPs and hospitals and spent time as an in-patient then the situation is far more complicated. You are likely to have a mixture of hand written notes and observations, type written letters and, more recently, computer generated letters and test results. There are also x-rays and scans to consider. The above does not address the issue of universal access. The last attempt in the UK to implement a system was NpFIT (The National Programme for IT in the NHS), a project initiated by the Labour government in 2002 and cancelled some years later having spent in the region of £12bn and having delivered very little. Government backed IT projects are notorious for being disaster areas. Where does that leave the patient? In the UK you have a right to access your medical records. Since 2000 onwards I have received copies of the follow-up letters from outpatient appointments that the consultant sends to my GP. This may be sufficient for your needs but I needed to fill in a lot of missing detail for the book I was writing. For the payment of a fee you can obtain copies of all your medical records . Requests forms are available online for each Healthcare Trust and as I had been treated by 3 different Trusts I filled in 3 different forms and sent them off with the relevant payments (between £20 and £50 depending upon whether you just require medical notes or want copies of x-rays and scans as well). A series of packets duly arrived and I was amazed to find they really did contain ALL my medical notes from October 1977 to the present. Two Trusts chose to send hard copies whilst the third had scanned the notes to a pdf file of over 700 pages. 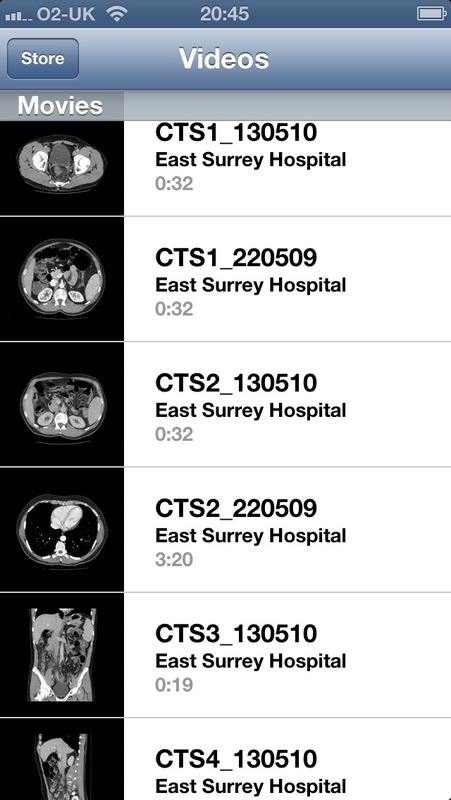 I also had loadable files for CT, MRI and US scans. The only things missing were certain early x-rays. My initial reaction was “information overload” but over the space of a few nights I sorted the documents by type and date order and picked out the “juicy bits”. Those bits that explained some long, unanswered questions about my treatment. Probably the most fascinating were the ward notes from the times I spent in hospital. These are not usually documents that you get to read. The discs containing CT and MRI scans looked a bigger challenge but I found a great piece of software called Horos which opens and views the files.. Hours of fun looking at 3D visualisations of your innards. What can you do with, potentially, a huge amount of very detailed medical notes? Whilst they might be of academic interest to the patient and provide a fascinating insight into how you arrived at your current state they are not a lot of use to your medical professionals due to the sheer bulk of the information. This is especially true if you are seeing a new consultant who needs a succinct overview of your medical history and current issues or if you end up in A&E (ER) where they need to start treatment as soon as possible. It gets considerably more complex if you are suffering from multiple conditions. Initially I put together all the major events into a spreadsheet table. Going through the process certainly gave me a good grasp of my overall health and I have ended up a much better informed patient. This helps greatly when you need to take decisions about the course of future treatment. It helps clarify the most important issues. There are more references appearing where patients are recording their consultant appointments or having consultations via Skype. Would these audio and video files need to be kept as part of your medical record? Do medical professionals expect to have access to any recordings you make? What follows is based on my experience being treated by the UK NHS as both an in-patient and an outpatient, mainly with gastroenterologists but more recently haematologists and hepatologists as well. The dynamics described may be different where you are funding your healthcare privately and paying a consultant directly or via an insurance company. If this post seems rather analytical and cold, with few emotional considerations, it is because I have found this “matter of fact” approach has made the Crohn’s, other minor annoyances such as PVT, potential PSC, BAM, hospital stays and consultants, a lot easier to deal with. For old hands at the “health game” most of this will probably seem blindingly obvious so it’s aimed at newer patients, ones that become tongue tied in front of their consultant or that find appointments difficult to handle. 1) Making Lists – Definitely in the “blindingly obvious” category. This has to be the best thing I’ve ever started doing. I used to go into the consulting room with the attitude “of course I’ll remember all the things I want to ask.” It was a male arrogance thing. I’d then arrive home and my wife would say “and what about x?” Blank stare. “Why didn’t you write a list?” Another blank stare. This went on for many years (male arrogance is a long term condition) until the penny finally dropped. Nowadays I start preparing a list several days before the appointment date. 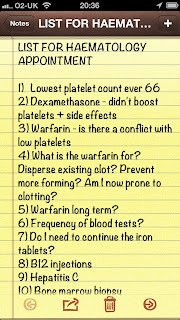 (The one shown below was compiled in preparation for seeing the haematologist prior to weighing up the advantages/disadvantages of starting Warfarin). Once you’ve written it out talk it through with someone close to you as they may have spotted things in your appearance or behaviour that they are concerned about but “didn’t like to mention” or didn’t think were significant. Nowadays, I print out the list and make a point of having it in my hand as I enter the consulting room and after the initial pleasantries explain that there are a number of questions I want to get answered and point to the list. This sets the scene for what follows i.e. don’t expect to finish this consultation until we’ve been through it all. It is worth noting down the answers, although these should be covered in the follow-up letter that you get sent a few days later. (Or rather SHOULD be sent – more about that further on). Another advantage of having a paper list is that if you print it, or write it out nice and legibly, and then become emotional or tongue tied you can hand it over and let the doctor work their way through it. 2) Manage Your Appointments – This may or may not be necessary depending upon how your hospital works. I get treated by two different departments in the same hospital. One of them will make the next appointment for you there and then so that you leave the hospital with the appointment letter in your hand. The other department says they will contact you closer to the time but there is always that doubt at the back of my mind that the request will get lost somewhere in the system and by the time I realise there’s a problem the appointment gets delayed. Nowadays I set a reminder in my calendar, two months before the appointment is due, to contact the consultant’s secretary just to remind them and that does the trick. Two months is the right length of time for me but it may differ in your area. For Guys and St.Thomas’ (GSTT) it’s usually between 3 and 6 weeks to get an appointment with a particular consultant or to book up for a procedure such as an endoscopy. 3) Continuity – Generally I like to see the same consultant each time so there is continuity in approach and it is not necessary for them to go through my whole medical history before starting the consultation. I didn’t used to question it when I was seen by different registrars or junior doctors but as my health worsened I really felt it could become a matter of life or death (maybe slightly over dramatic!) that I saw the person with the most experience/expertise and who understood my case. The best way to approach this is to tell the nurse that weighs you that you need to see a particular consultant and they can then put a note to that effect on the front of your file or make sure your notes get put in the right pile. Occasionally it doesn’t work and you end up being called in by another doctor. At that point I politely explain that I’m not doubting their medical knowledge but I do need to see my usual doctor. This has always worked OK.
All the above goes out the window if I’m just having a routine, follow-up appointment where no important decisions need to be made. If that’s the case I’m happy to see any of the doctors. I do actually question whether this type of appointment has any value and would be quite happy to do it by email, Skype or even an old fashioned telephone call. The only advantage of the face-to-face contact that I can think of is the doctor being able to spot something of concern that you haven’t noticed or the ability to carry out a physical examination. 4) Medical History – important if you are seeing new doctors or consultants. 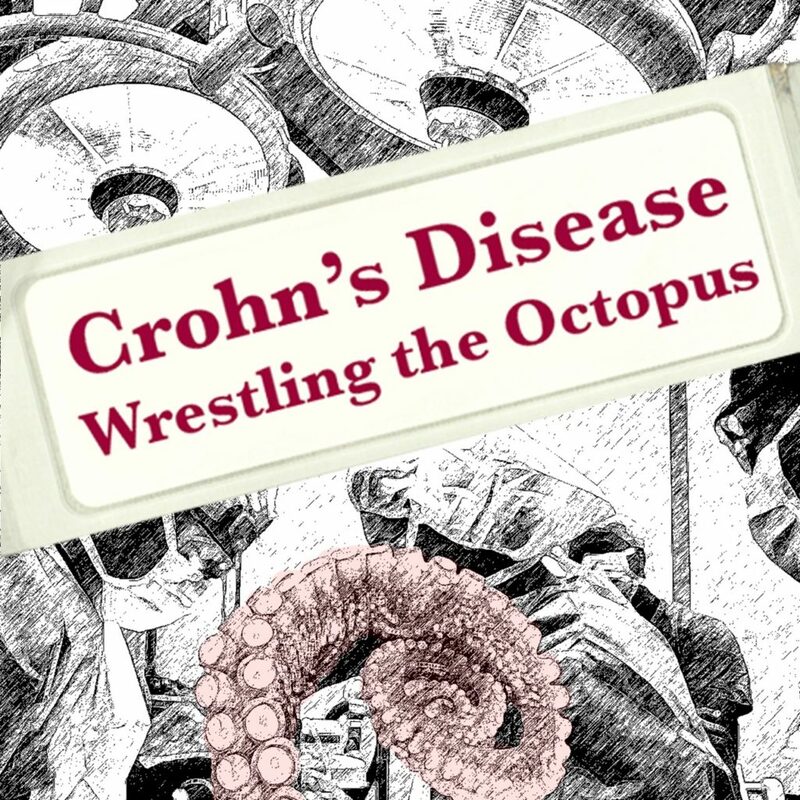 If you’ve only been suffering from Crohn’s, or whatever disease you’ve got, for a short period then it’s likely that you can remember all the key dates and events that have brought you to this particular appointment. If you’ve always been treated by the same hospital then your medical history should be available to any of the professionals treating you via their records system but if you’ve moved around between hospitals, health authorities and consultants then it is likely that there won’t be one single, unified set of records. When moving to a new consultant and/or hospital, or if you are unfortunate to have been admitted to a new hospital as an emergency, possibly unconscious, then a brief outline of your history can save a lot of time in the early stages of working out what has gone wrong or which will be the best area to start investigations or treatment. [For years I was always being asked when was my first Crohn’s operation and what exactly the surgeon did at that time. 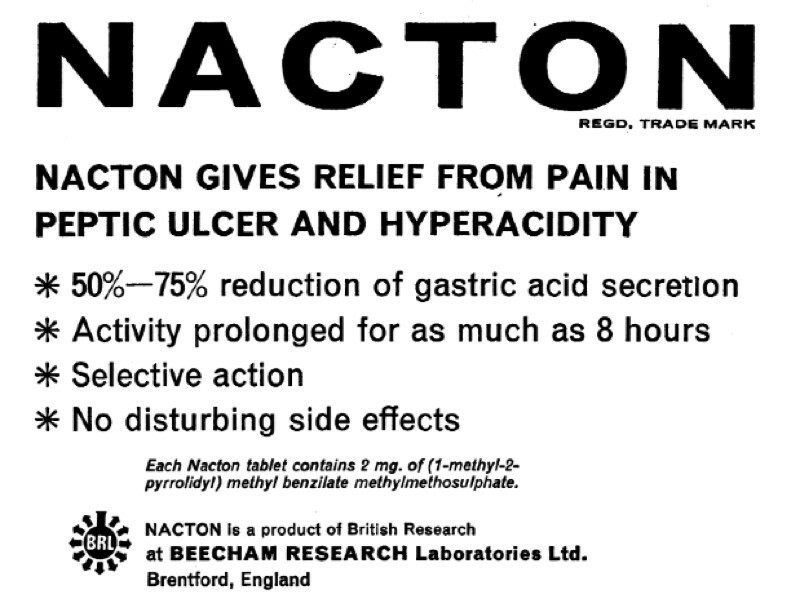 I knew it was an emergency admission to Croydon General Hospital sometime in 1979 (suspected appendicitis) and that it turned out to be a perforated bowel, but I couldn’t say whether any gut had been removed or if it had simply been repaired. It was only in 2011, when I obtained copies of all my medical records from Croydon Health Authority that I could finally give the definitive answer. Since then I’ve painstakingly, some would say anally, extracted all the key points from consultation notes and follow-up letters and summarised the whole lot, in date order, onto a spreadsheet. 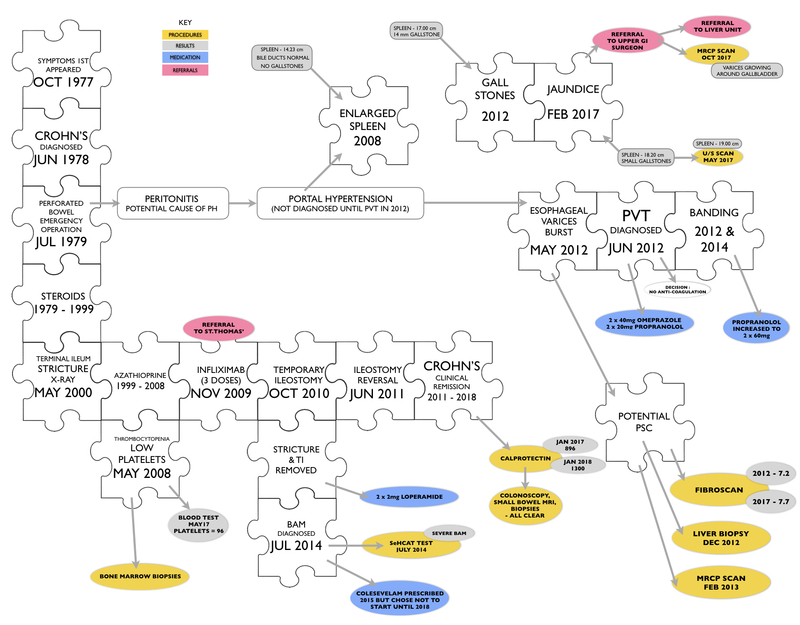 This is my “back-up” evidence from which I have then drawn up a simple, one page chart representing my full Crohn’s history and a second, more detailed one, covering the last 6 years. My current set of consultants seem to approve of this approach and have put copies into my notes. 5) Contacting your consultant between appointments – Some consultants are happy for you to email them directly when you have a query or a problem or there may be a dedicated, condition specific, helpline that you can use as the first point of contact. It really does seem to vary. I have read of other patient’s experiences where the “patient confidentiality card” is played to avoid email contact. I’ve never come up against this. So far so good. You should be able to work out an individual email address as organisations like to follow a particular format or you could simply ring up their secretary and ask for it straight out. Nowadays many hospital websites clearly display the consultants contact details. This doesn’t come without some responsibility from the patient’s side. I make sure that I only contact the consultants directly if I have something that is urgent and only they can answer or they’ve asked me to report back about a problem. I was being treated by three different specialities during 2012/3 so I usually copied any emails to all three consultants as it helped to maintain the co-ordinated care. It is worth keeping copies of the emails as I found out when I went to have a second bone marrow biopsy and the doctor performing the procedure was not aware that she needed to use a blood thinner to get usable samples (which is why the second biopsy was required). I was able to show her, on my phone, the email trail that explained it all after the previous biopsy. 6) Follow-up letters – shortly after an appointment or procedure your consultant should write a letter to your GP – secondary care provider to primary care provider. These letters are important to keep your GP up-to-date with your condition and a copy should also be sent to you, normally with a caveat that it is a communication between medical professionals. This system of follow-up letters has always worked smoothly for me with gastroenterology and hepatology issuing them a couple of days after the appointment but then I came up against Haematology. The appointments were fine. Lots of good, open discussion but no follow-up letters. Four appointments and no follow-up letters. I did query this a number of times but still no letters, just apologies. A few months on and guess what, still no follow-up letters. In the end I looked at my hospital’s website and found the name and email address of Haematology’s head of department. I contacted her, explaining the situation and suddenly I had four, retrospectively written, follow-up letters. Are there lessons to be learned? I think so. Lesson 1 – If you are not getting the service you should expect then go to the top and explain the problem. Will this always work? No, but might at least set the wheels in motion to getting a solution. Lesson 2 – Keeping your own record of what gets discussed and agreed during a consultation is worthwhile if you end up in a similar situation to the above. I use a blog to record what goes on but if you don’t want to share your experiences with others then keep your own private health diary for future reference. 7) Manage Your Appointments 2 – er, haven’t we already done this one? Yes, but this is managing how the actual appointment goes. I’ve left this one almost until the last as it’s fairly new territory for me. I hope to develop the theme in the future to reinforce the notion that the patient should actively manage how the appointment goes and make best use of the resources available i.e. your consultant’s experience and advice. This train of thought was triggered by a visit to, yes you guessed, Haematology when things started to go very wrong. My usual consultant wasn’t available so I was being seen by a new doctor. The lack of follow-up letters meant that he started discussing a subject that had been “parked” a year previously. At that point it struck me that going into the appointment I had a very clear idea of the outcome I was expecting and of the information/areas/risk factors we needed to discuss to arrive at a conclusion. 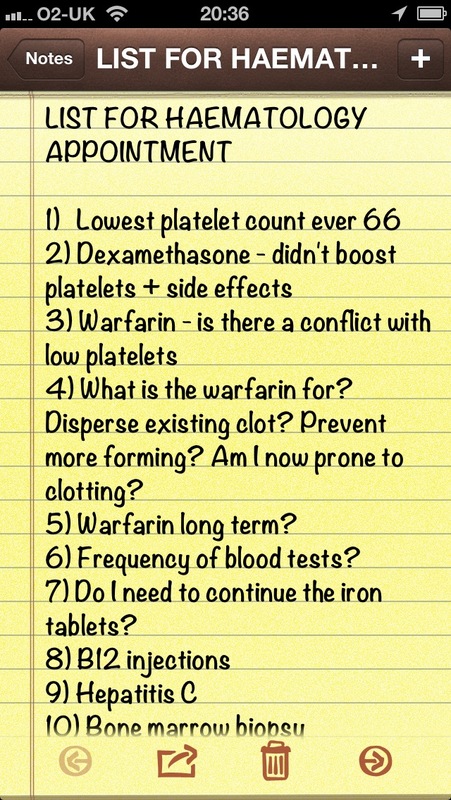 (The decision was whether to start Warfarin or not). Clearly my issue wasn’t with the new doctor, as he had simply referred to the latest notes, so I asked to see the Head of Department. I knew this would never happen, but at least it had the effect of getting the appointment back on track with the appearance of one of the senior consultants who had been a party to reviewing my case at a recent MDM (multi-disciplinary meeting). I ended up with the decision I had been expecting. I’m wondering if it would be worthwhile starting the next appointment by explaining where I want to be the end of the appointment and how I see us getting there. Would that be too pushy? 8) and finally – as always – keep a sense of humour if you can – useful in surviving ALL medical encounters but I accept this is not easy if you feel really terrible; you’ve been waiting an hour to be seen; the phlebotomist has made several attempts at finding a vein; that person who arrived after you has just been called in before you; etc. – I’m sure we’ve all been there. Sometimes humour doesn’t work. A few of the doctors I have met do seem to have had a “humour bypass” (I’d just like to make it clear that this doesn’t apply to any of the fine doctors who are treating me at Guys and St.Thomas’, especially the ones that drive the endoscopes or biopsy needles). I have however been left in the situation in other, lesser establishments where my witty remark has gone down like a lead balloon and I’m left staring at a doctor who is clearly thinking “should he be in the psychiatric ward?”. ..and remember if you’ve been kept waiting longer than you were expecting it’s probably because your consultant has spent more time with preceding patients than the allotted 10 minutes. This works both ways. You may also need more than your ten minutes.